Monday morning the team was energized for a week of finishing up their short-term projects, aimed at improving the daily lives of the Daasanach tangibly. This is to be completed within the two week period of the first course of the Global Innovation program, EAS 312: Engineering for the Developing World. Emily Aviles and Winnie Wang entered the week ready to construct their biosand filter. 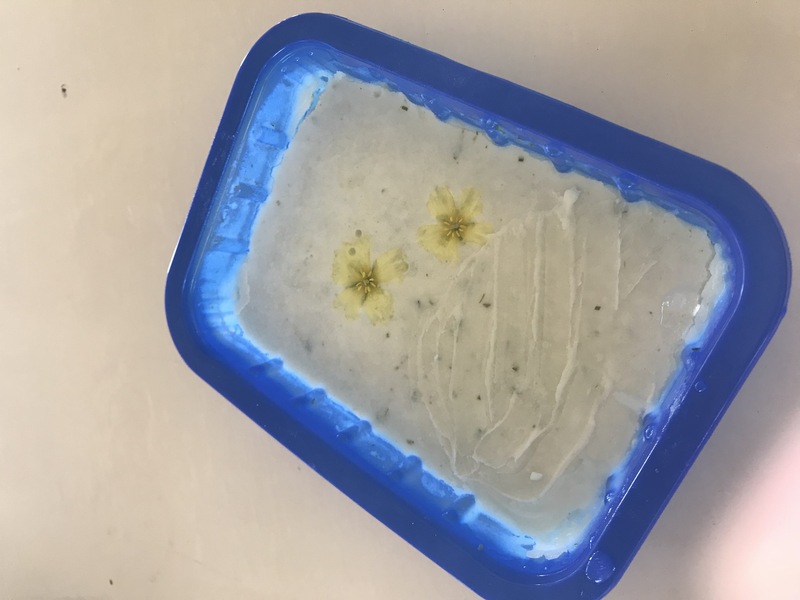 Sam van der Poel was waiting on materials to create his soap. 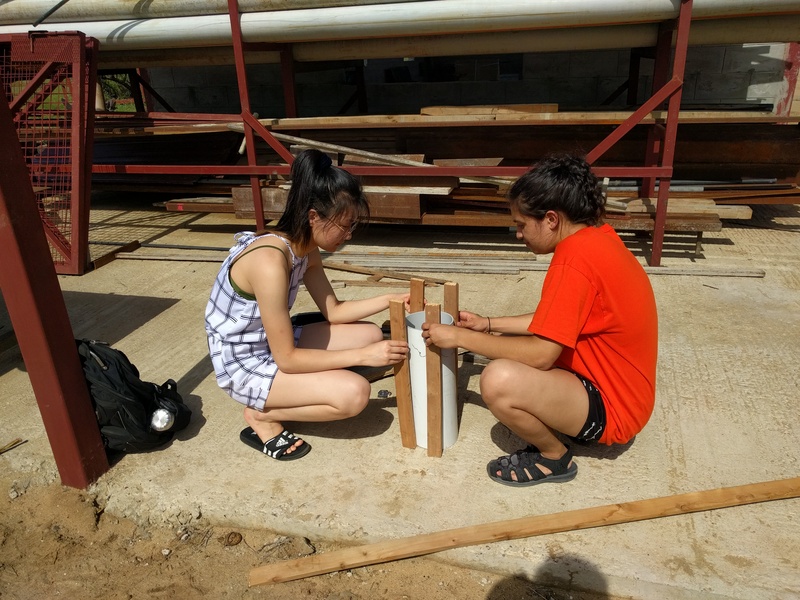 Natalie Lubaszka and Konnie Xu had just finished designing the pump and excavation tool (shovel created from metal scraps) for retrieving water from a riverbed. 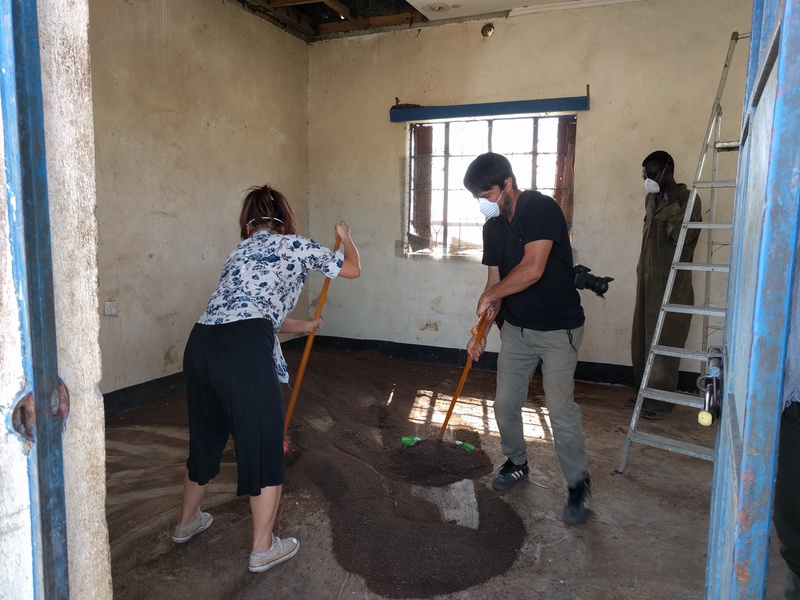 While leading the students, Professor Rodrigo Peña planned a project to tackle a bat infestation in a building at the health clinic and Joseph Kocaj continued the feasibility study for a pump station for the Turkana Basin Institute (TBI) under Rodrigo’s supervision. The day started with a tour of the TBI. TBI is largely self-sustaining, making this an opportune learning experience for the students. Rodrigo lead us first to the workshops and metal shops. We learned that all furniture at TBI is manufactured on site by the extremely skilled staff. 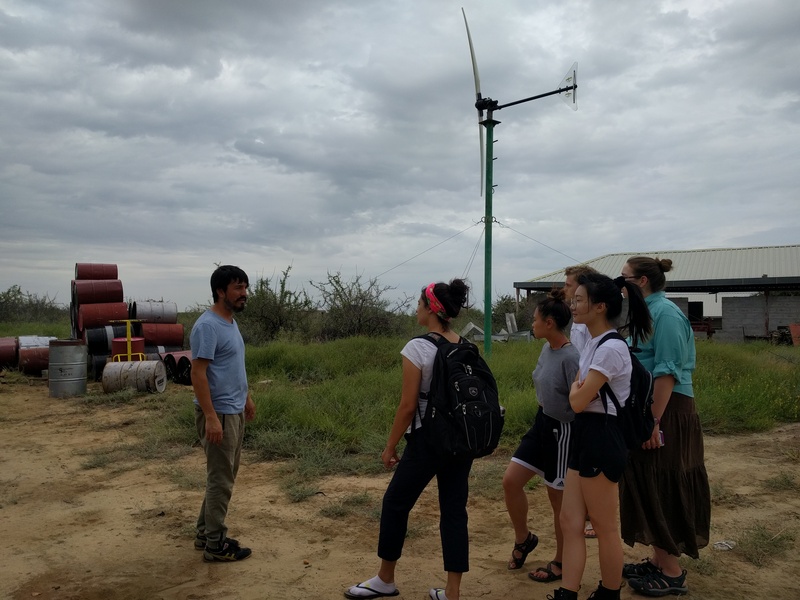 Next we visited several methods of energy production including photovoltaic systems and a wind turbine. At this point Timothy, TBI’s Assistant Camp Manager and Field School in Charge, joined us to supply insights from working at TBI for nearly a decade. 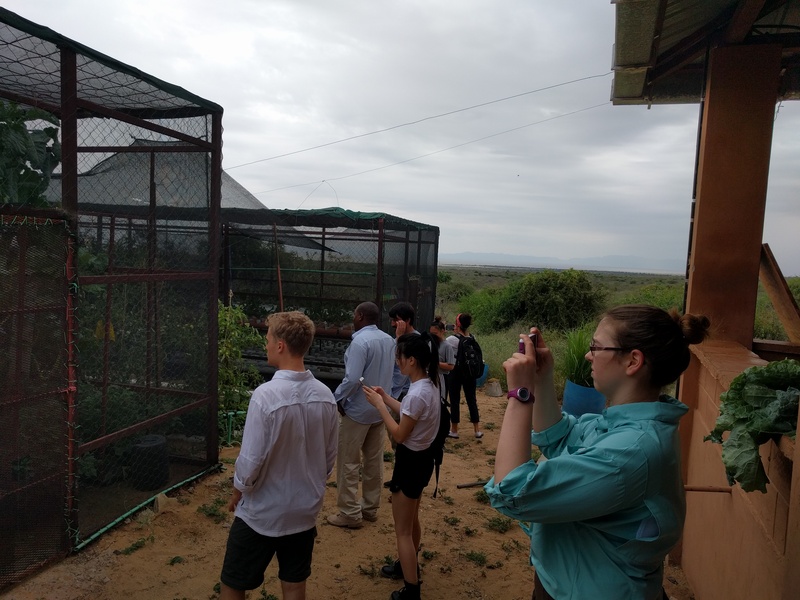 From there we visited a hydroponic garden, brick manufacturing facility, reverse osmosis plant, and water storage unit. A look at TBI’s hydroponic farm. Timothy describes TBI’s water storage and collection system on top of a large water storage tank. 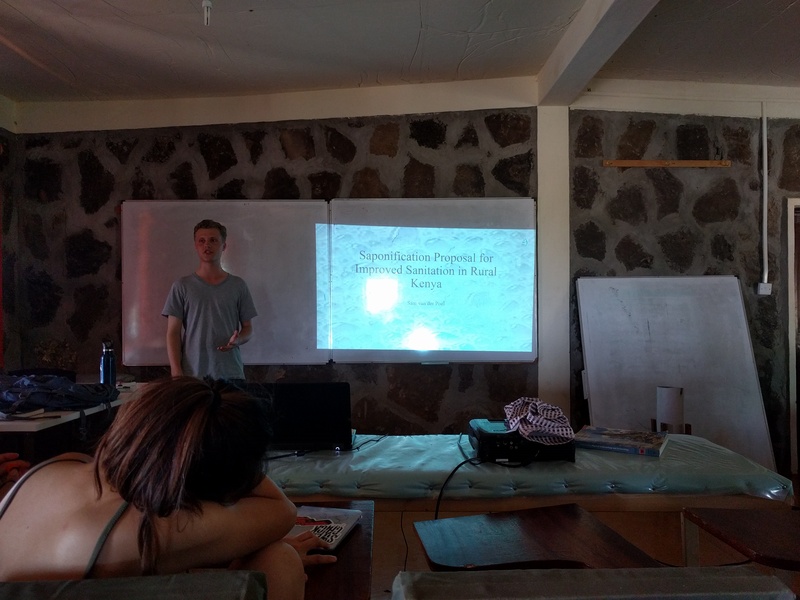 In the afternoon the students casually presented their project progress for feedback. Hearing everyone’s ideas and opening a discussion was fun for all and the project teams left the presentations feeling ready to finish up their projects. 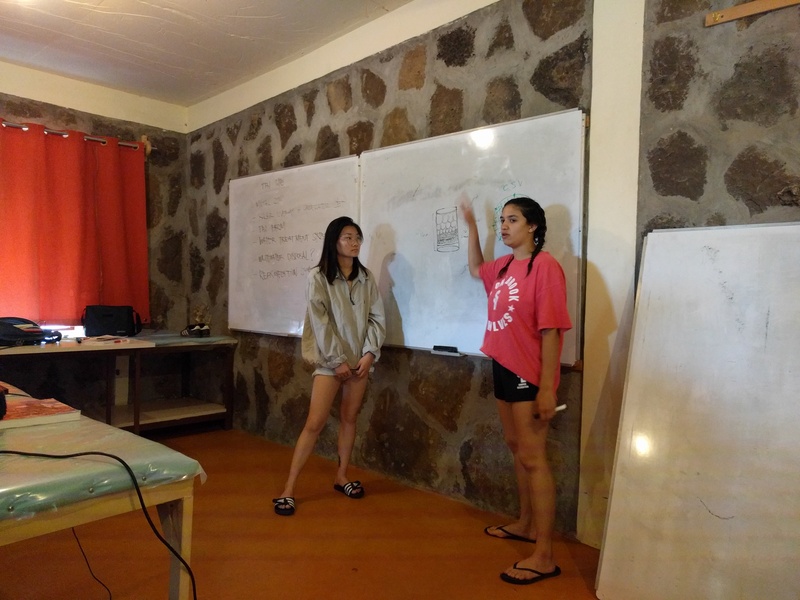 Winnie Wang (left) and Emily Aviles (right) present their project progress. After last year’s Global Innovation program Rodrigo Peña was determined to build off of Saffron Livaccari’s motivation to bring music oriented opportunities to the students of Ileret’s schools. He brought a dozen and a half recorders with him to donate to the school. Not without lessons though! To start things off easy, we taught them Hot Cross Buns which was mastered by the end of the day. 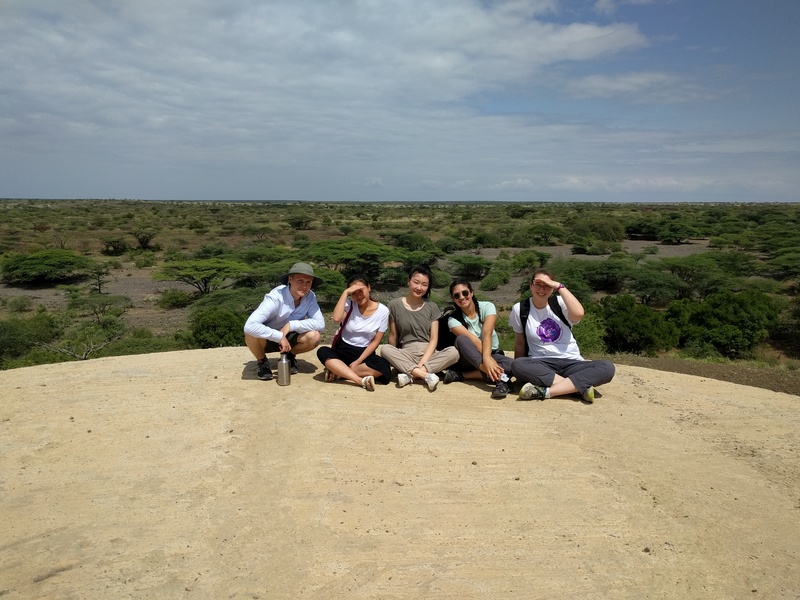 We plan to visit several more times to continue lessons before leaving Kenya. 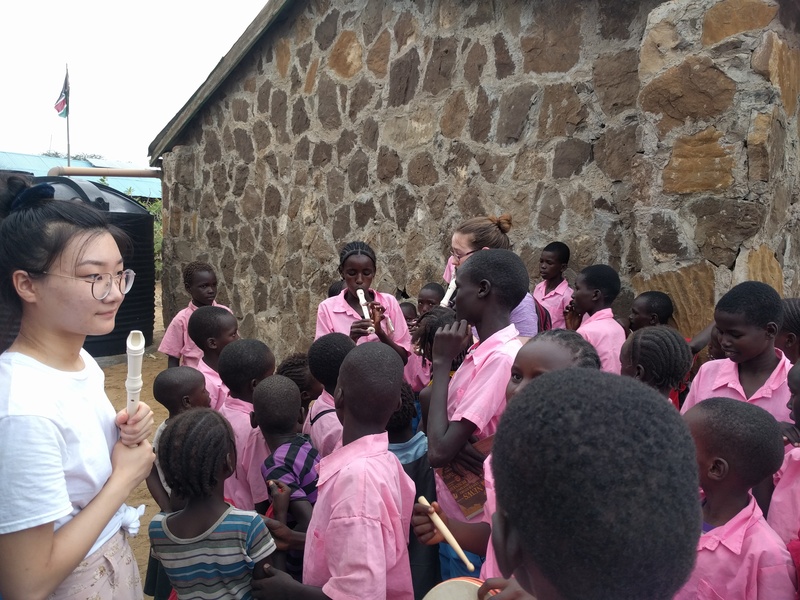 Winnie Wang showing the students of Ileret how to play a recorder. On Tuesday morning rain started to pour and the day seemed gloomy but the Global Innovation students were as motivated as ever to progress their short-term projects. Emily Aviles and Winnie Wang were busy constructing their biosand filter. Splitting up to cover more ground, Emily began construction on the filter while while Winnie worked on activating carbon for filtering purposes. After a while the team came together for final touches and began testing the filter. The visual effects were noticeable immediately! What entered the filter as murky water exited clear. Winnie Wang (left) and Emily Aviles (right) test their filter. 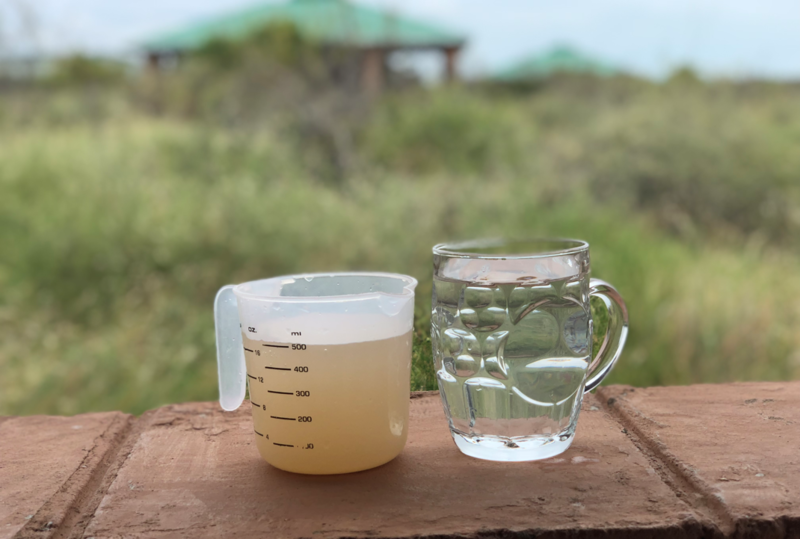 Water before and after filtering. Sam van der Poel received all necessary materials to create his soap including a sizable amount of animal fat. After mixing ash with water for a little under an hour the lye portion of the soap mixture was ready. 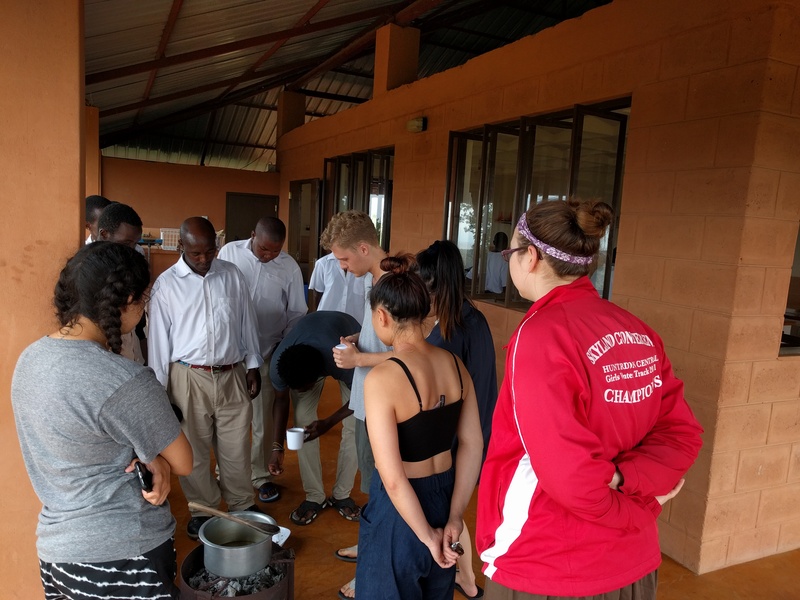 While preparing the fat and stove for heating up the mixture many TBI staff members were an extraordinary help to Sam including Habara, Mutuku, and Timothy. Mutuku, Timothy, and Habara aid Sam in creating soap. Konnie Xu and Natalie Lubaszka also began to see tangible evidence of their project coming together. The pump’s main shaft was constructed and a new design for the shovel was designed and ready to be worked on over the upcoming days. Natalie Lubaszka (left) works on the pump with help from Rodrigo Peña (right). 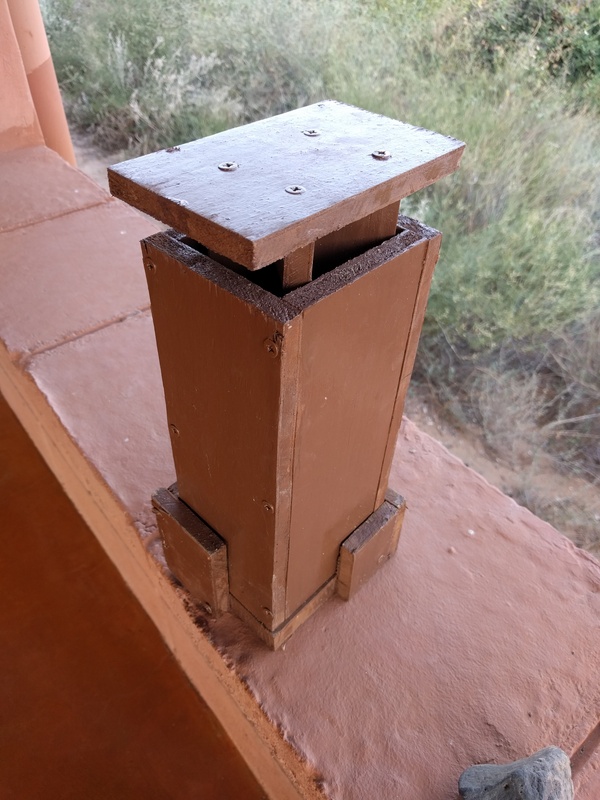 Motivated to progress her side project, Konnie Xu produced two briquettes as well with the tool she constructed last week. Joseph Kocaj also measured all existing structures at TBI, as many roofs have gutter systems which lead to the stormwater collection reservoir. This was a necessary step in the pump feasibility study. 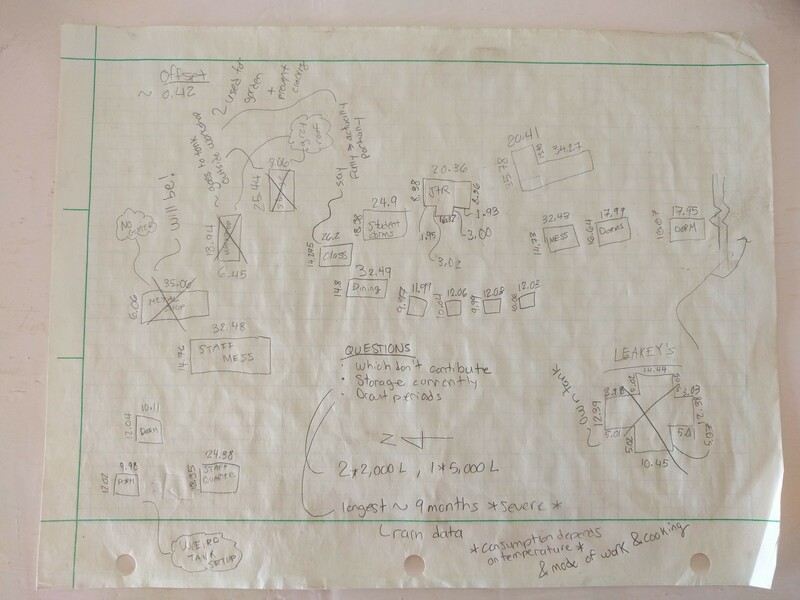 Joseph Kocaj’s field notes, to be uploaded to AutoCAD. Later Tuesday afternoon the students played another game of soccer with the TBI staff! 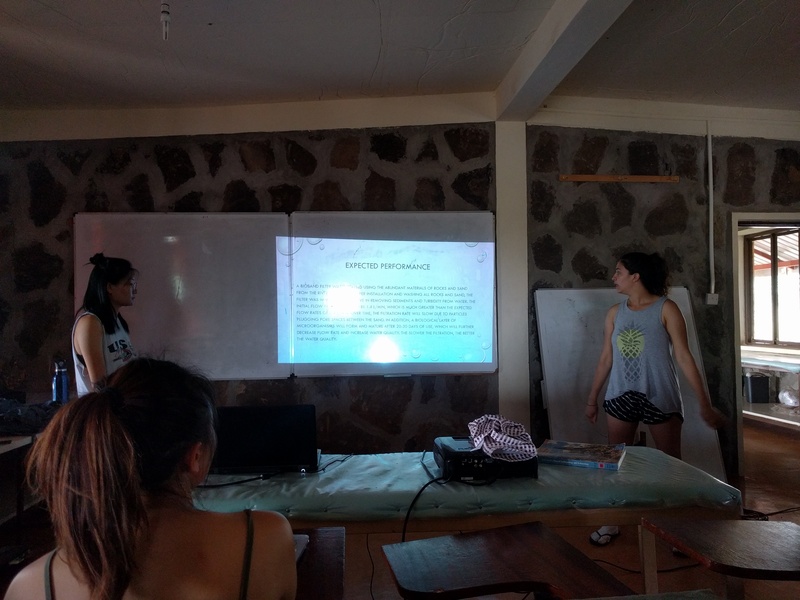 Wednesday while the students progressed their projects the main activity of the day was preparing for Rodrigo Peña’s bat infestation removal project. The building which is being focused on consists of two rooms, both full of materials. 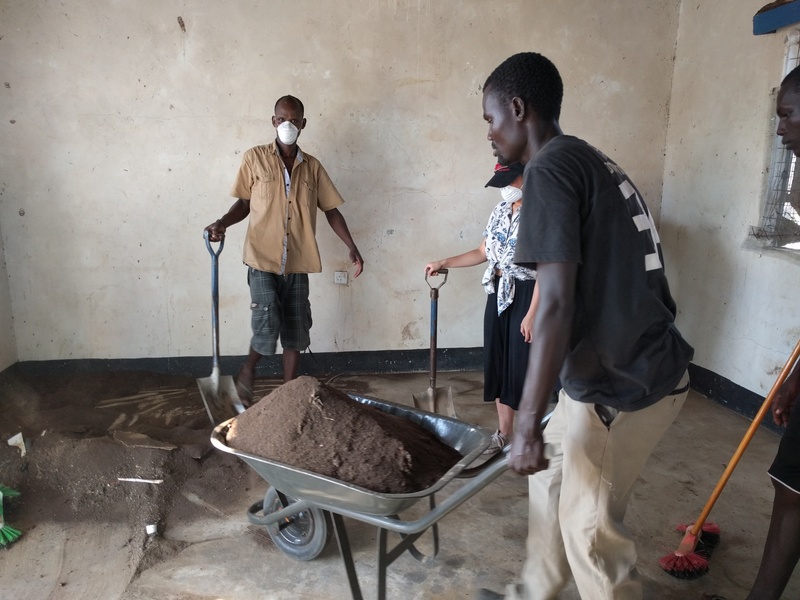 To prepare Beatrice, the head of Ileret’s health clinic, said she would “mobilize” the women of Ileret to move all materials from one room to the other so that one room could be worked on at a time. What a perfect word mobilize was. Dozens of women showed up and the room to the left was cleared in no time. The materials to be moved out of one of the rooms for the bat infestation removal project. 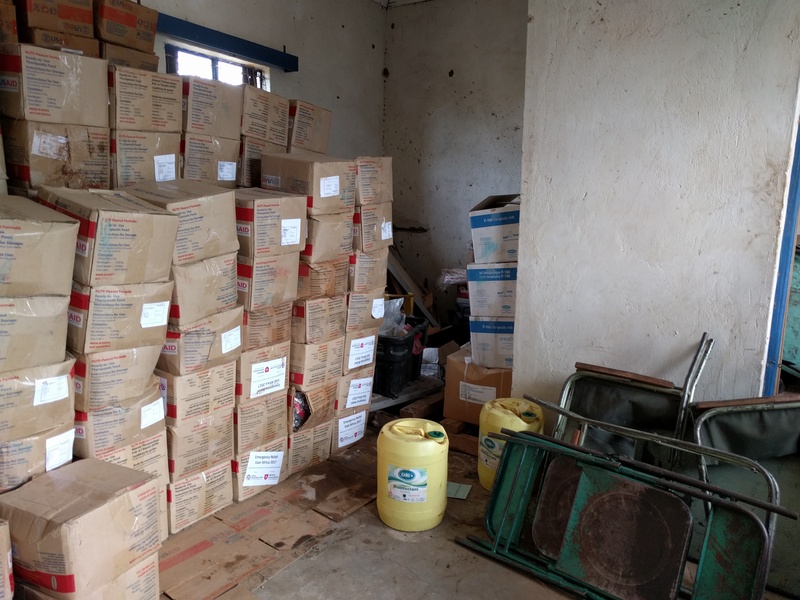 During this visit to the health clinic we learned that Joseph Kocaj and Addison Shogren’s temporary septic tank behind the maternity ward was being replaced with a proper one featuring a placenta pit, funded by Marsabit County. The County offered to build a fence around the property but Beatrice insisted that a septic tank was much more important. 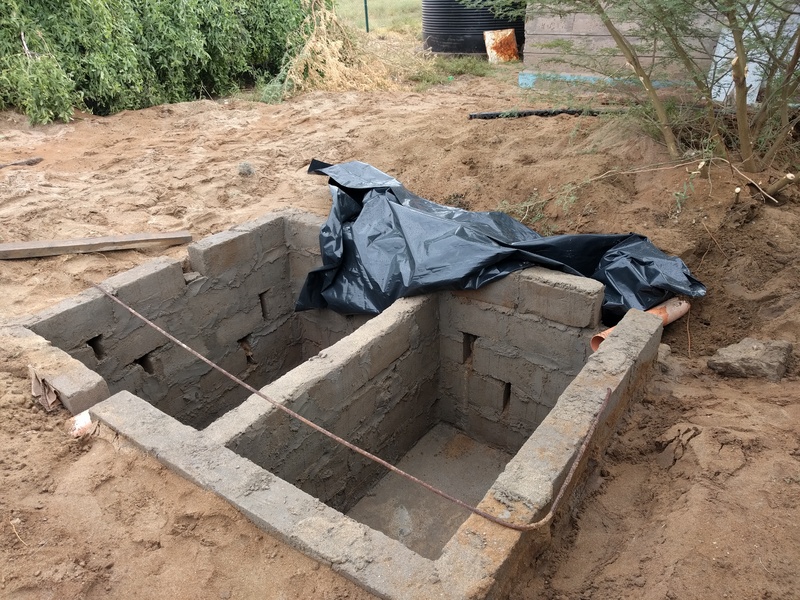 The health clinic’s upgraded septic tank being constructed. 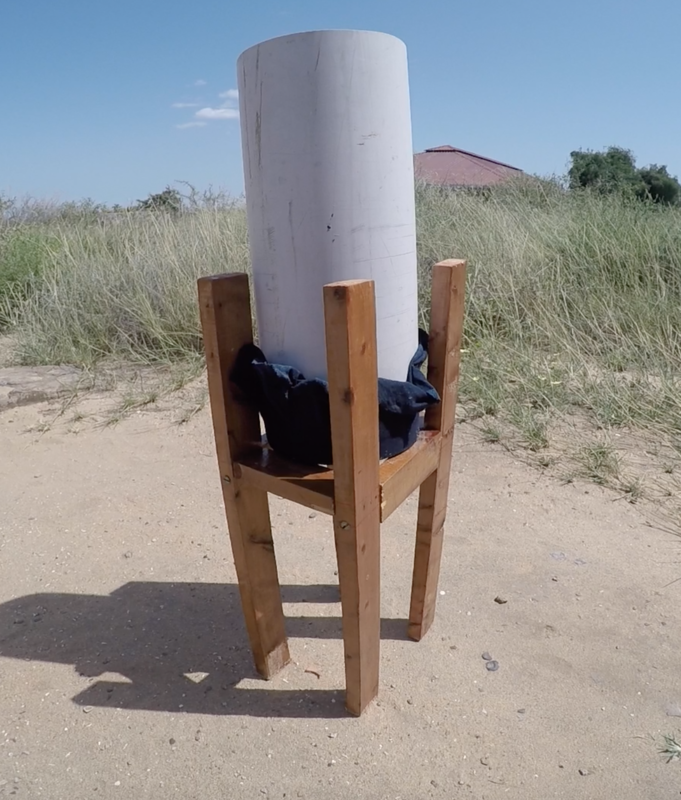 In terms of projects, Emily Aviles and Winnie Wang constructed a stand for their filter. 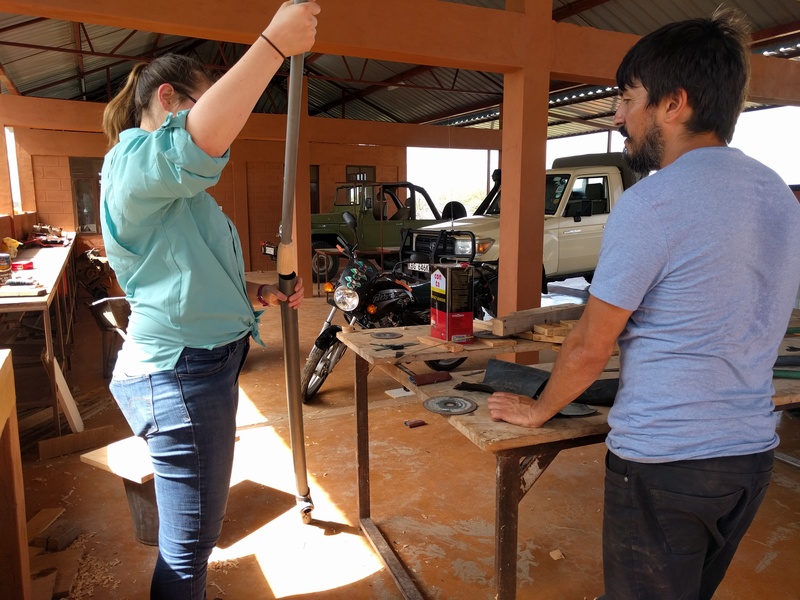 Natalie Lubaszka continued work on her pump with the help of Timothy while Konnie Xu finished constructing her shovel with help from TBI staff member Daudi. Sam van der Poel began writing instructions on creating soap to be printed. Winnie Wang (left) and Emily Aviles (right) preparing the stand for their filter. Thursday we went on a site visit to a pumping station. A solar energy powered pump brings water from the ground to a storage tank. 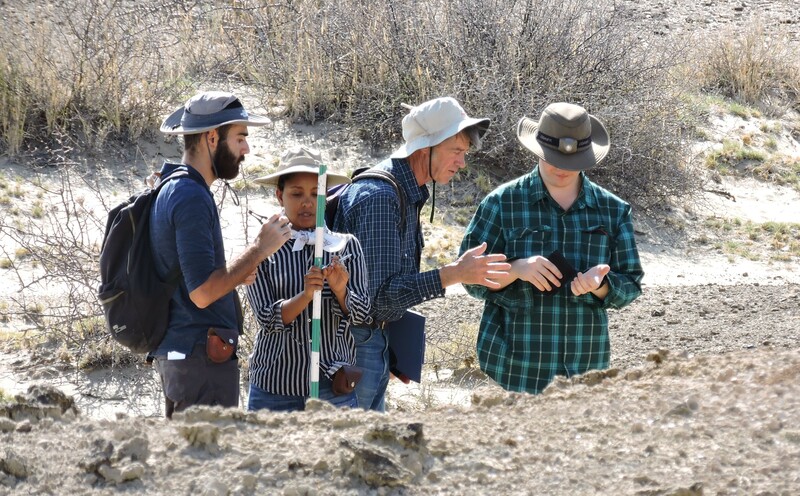 While the drive to the site was about a 2 hour drive the students agreed that the experience was well worth the trip! Thursday ended with a typical Thursday afternoon soccer match! 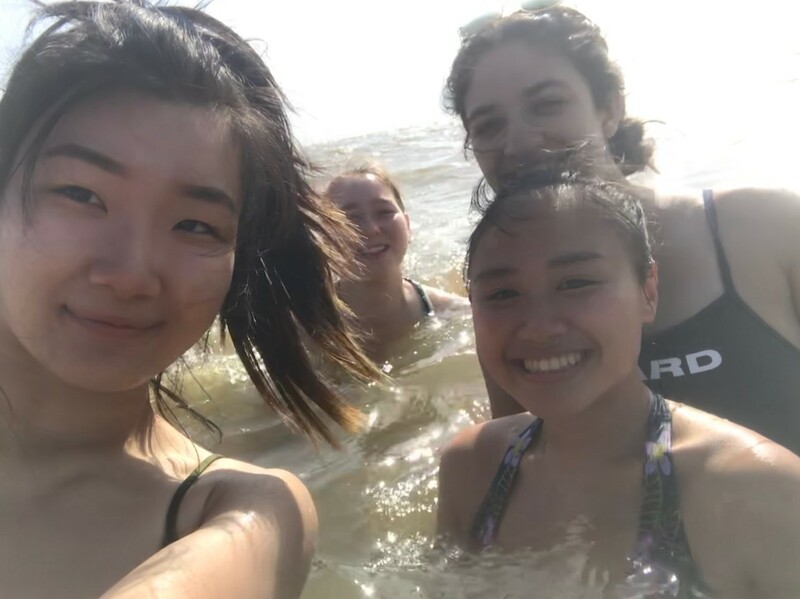 (Left to right) Sam van der Poel, Konnie Xu, Winnie Wang, Emily Aviles, and Natalie Lubaszka on top of the water storage tank. Friday morning marks the most monumental point of Rodrigo Peña’s bat infestation removal project thus far. Last year Rodrigo learned that simply smoking that bats out of the building’s attic will not work. 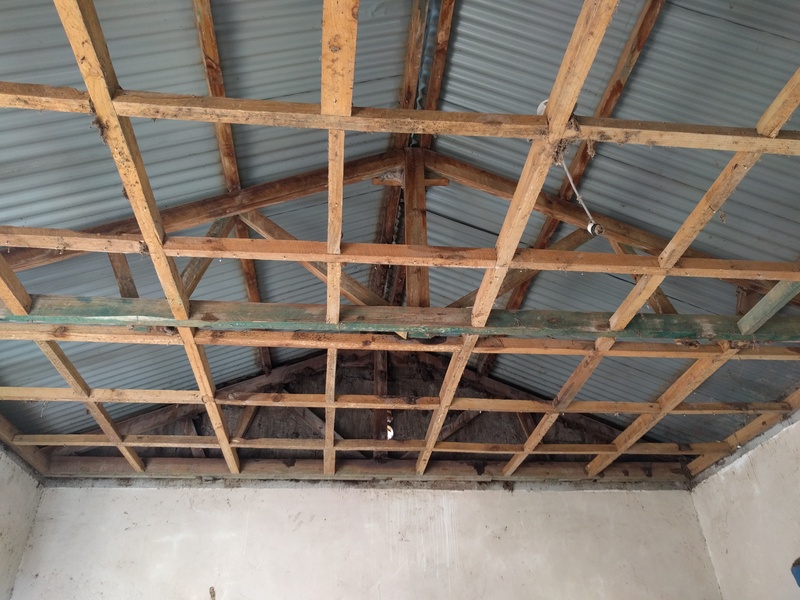 The ceiling needed to come down to ensure that bats had no place to hide. While it was understood that the bats freely urinated and defecated above the ceiling, the magnitude was impossible to imagine. What seemed like mounds of dirt fell along with the ceiling tiles as it was taken down. Konnie Xu (left) and Rodrigo Peña (right) sweeping up the bat waste. The smell cannot be described with words. A TBI staff member transporting a wheelbarrow full of bat waste. 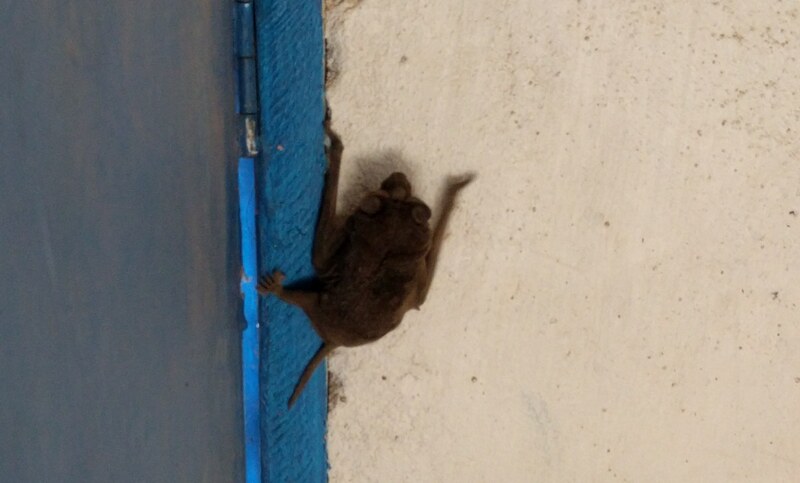 At the end of the day, the ceiling was completely removed from the first room and the bat waste had been swept up. The room was ready for painting and new shelves. One of the bats to be evicted. A fully opened ceiling in which bats can no longer hide. Lunch was a special occasion that evening, a TBI board meeting of sorts was occuring in Ileret. 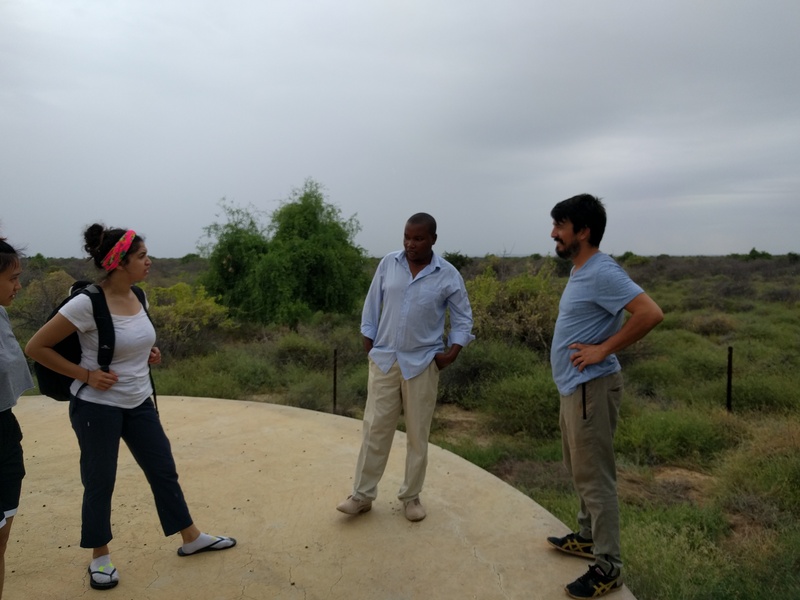 While there were many extremely interesting people the Global Innovation crew had a chance to converse with, including Louise Leakey, we were perhaps most shocked by the presence of Stony Brook University’s President Samuel Stanley and his friend Jim Simons. Stanley took most of his lunch time to converse with us and recall his experience as a doctor in Gabon in West Africa. 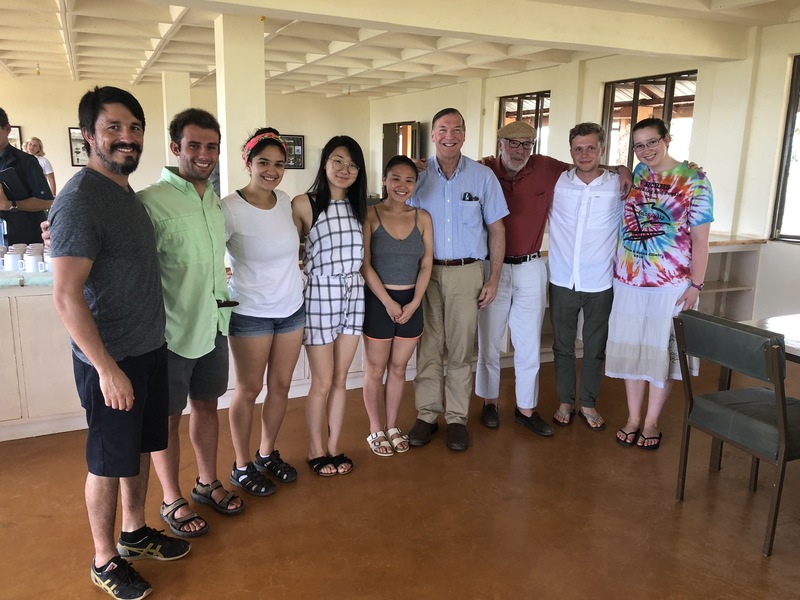 (From left to right) Rodrigo Peña, Joseph Kocaj, Emily Aviles, Winnie Wang, Konnie Xu, President Samuel Stanley, Jim Simons, Sam van der Poel, and Natalie Lubaszka. With the final projects constructed, Friday night into Saturday morning the students finished up final presentations and project videos as Saturday afternoon was time to present! Emily Aviles and Winnie Wang’s final filtering system. Sam van der Poel’s soap. 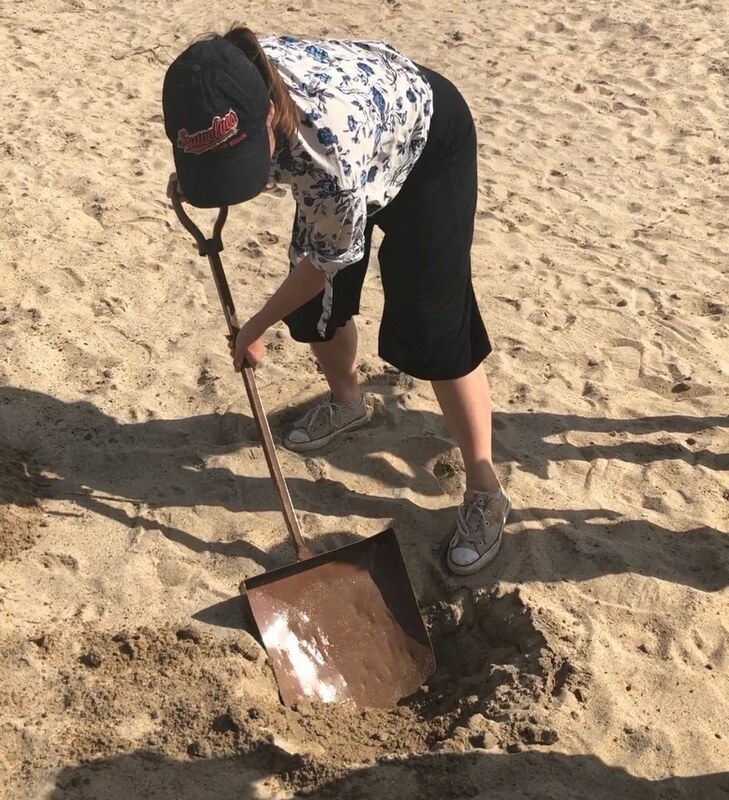 Konnie Xu testing out her and Natalie Lubaszka’s shovel created from metal scraps. Konnie Xu’s side project, the briquette maker. Konnie Xu and Natalie Lubaszka’s pump. 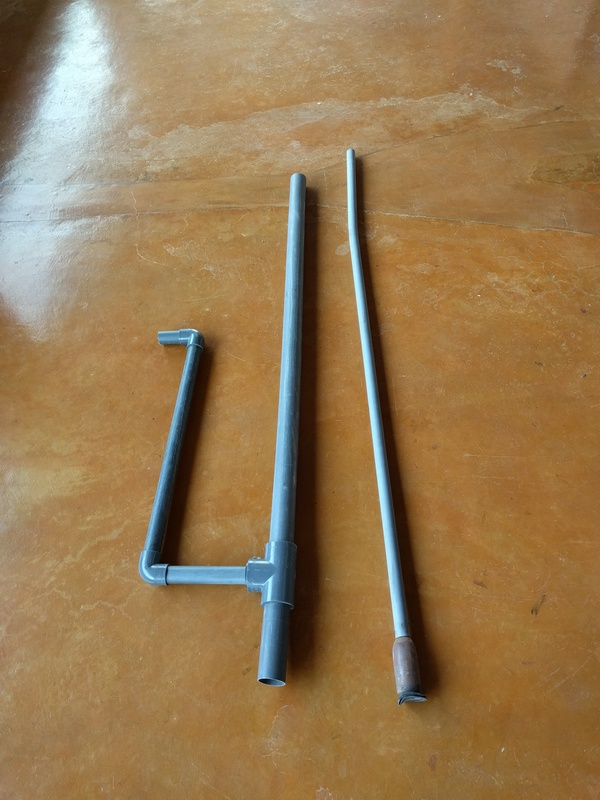 To the left is the frame and to the right is the plunger. 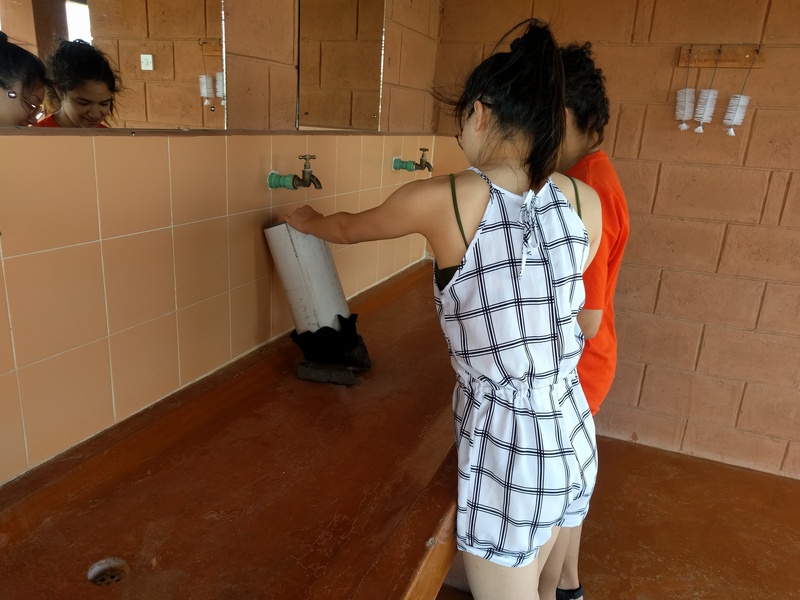 Emily Aviles and Winnie Wang spoke of their filter’s success in visibly changing the quality of water collected from the riverbed and plan to perform a demonstration at Ileret’s primary school. The activated carbon was not feasible to implement in the two week span of this project but the team had suggestions to continue work on the matter. Sam van der Poel similarly reported success in creating soap and will perform a demonstration at the primary school. 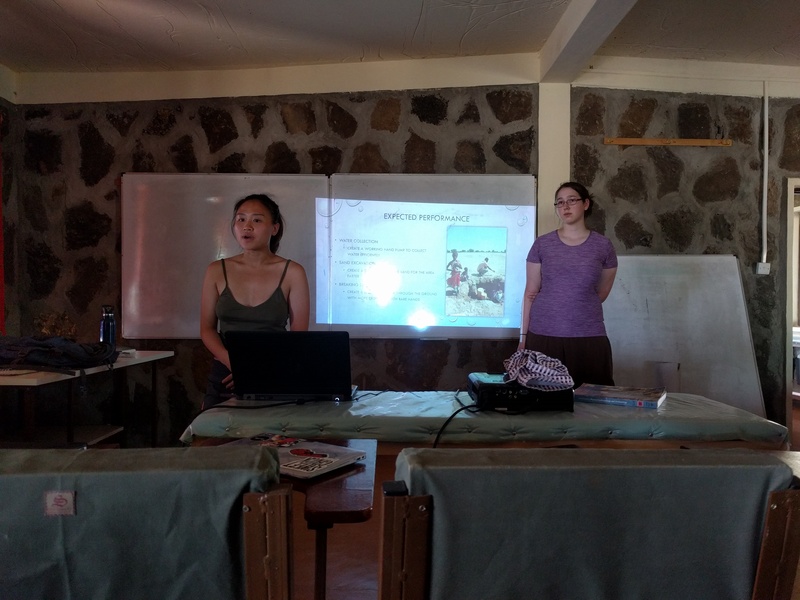 Natalie Lubaszka and Konnie Xu presented on the success in constructing a shovel but also the difficulties in creating a feasible shovel which can be implemented in the community and a working pump for the riverbed. Overall the students have much to be proud of! Winnie Wang (left) and Emily Aviles (right) presenting their project. Sam van der Poel presenting his project. Konnie Xu (left) and Natalie Lubaszka (right) presenting their project. After two weeks of extremely hard work the team took Sunday as a well deserved break! 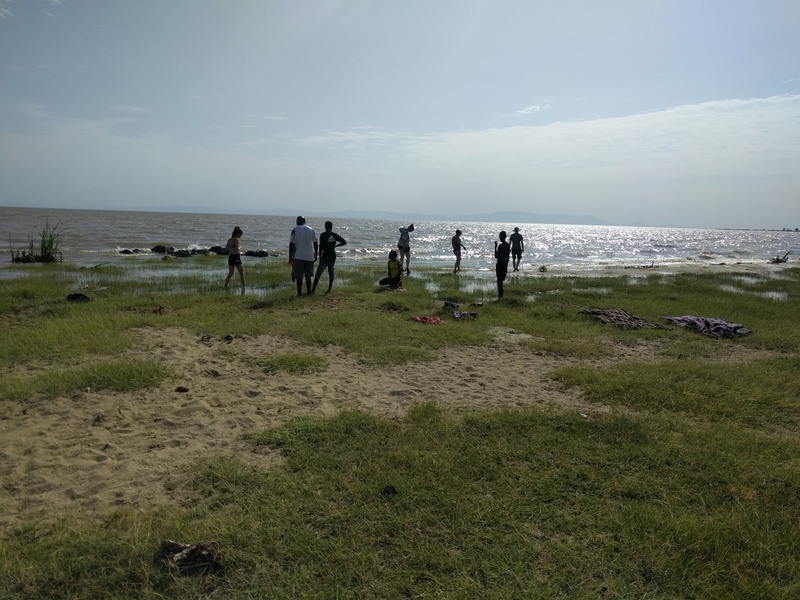 The students went to Lake Turkana’s shore to enjoy some sun and water. At first the students were hesitant to swim because of crocodiles living in the large lake. However, Timothy ensured corcodiles did not visit this portion and after Joseph Kocaj and TBI staff member Lolim ran in as test dummies the students followed suit! 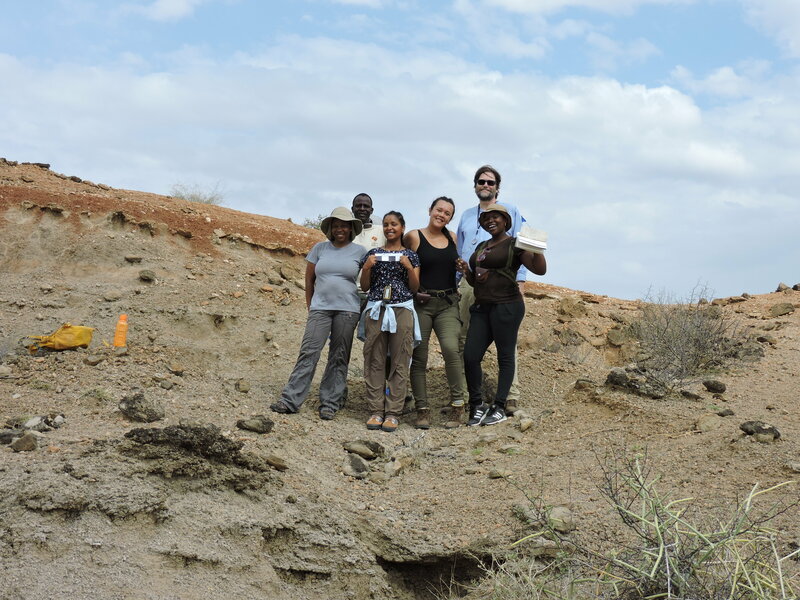 The team at Lake Turkana’s shore.